Many people ask us what dictionary we recommend. I will tell you our recommendations in a minute, but first let me ask you four questions we considered in making the choice for our classrooms. 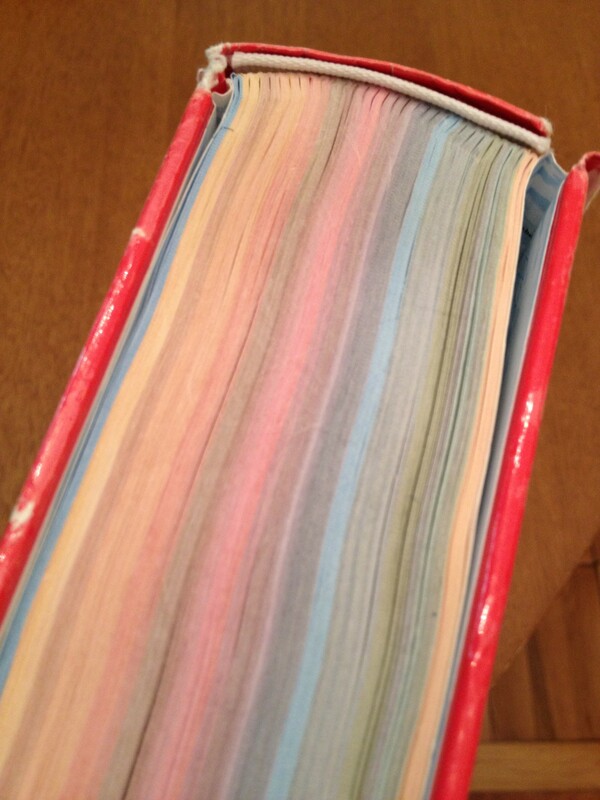 Students’ favorite dictionary: colorful and frequently used. This seems silly, but it’s really important. If you (or your child) likes the dictionary, you will use it more often. Your child will linger over it, flipping pages and discovering new words. If it is too heavy or the letters are hard to read or you wish you had gotten the other one with the prettier pictures? Then that dictionary will sit on your shelf. And “on the shelf” is the wrong place for a dictionary. 2. Is it American or British English? Dictionaries that say “Webster” have American English (A.E.) and dictionaries that say “Oxford” have British English (B.E.). (Just to confuse you, Oxford does have some American dictionaries, clearly labeled). If it doesn’t say Webster or Oxford, look up words that mean different things in the two countries. An A.E. dictionary will tell you that a cot is a roll-away or camp bed. B.E. says it is a bed for a baby. A.E. says that a torch is a burning stick used for light. B.E. says that a torch is a battery powered, handheld light source. The spelling of some words will be different, too: color, center, and realize in A.E. ; colour, centre, and realise in B.E. Different spellings and definitions are why we recommend an A.E. dictionary. 3. Is it the right level? First, they quickly give you the definitions you need. Sure, some people need to know that a flower is a reproductive part of a plant containing a pistil and stamens. But if you don’t know that English word yet, you probably just need to know its the pretty, colored thing on plants. Second, many of the words in a children’s dictionary are the ones skipped over when studying English in a classroom. American children learn the word “moccasin” early on in school, often when they discuss Thanksgiving in kindergarten or first grade. We don’t usually put it on the tests for adults like the TOEFL because adults rarely need to know the name for Native American shoes. Yet moccasin may be harder than college-level words like omnipotent because it can’t be broken down into familiar root words, prefixes, and suffixes. For one week, keep track of the words you want defined – keep a piece of paper in your pocket, perhaps. When you go to the bookstore, compare the definitions in first, children’s, student, and collegiate dictionaries. Which gives you the information you need? 4. Is it well written? Yes, someone wrote all those little bits and pieces, and some people/companies are better at it than others. I personally like Merriam-Webster’s definitions best, most of the time. They strike a good balance between giving the most readable definition and capturing the emotion and other details of a word that live beyond the exact meaning. This may be hard to judge if you don’t feel confident in your own English skills, but try a word that you are familiar with and that has an emotional or artistic meaning, like “beauty” or “regret.” Try some basic nouns like “cat” to see if they capture the important details of the thing. Finally, look at the difference between synonyms: “house” is the physical building, but “home” feels more personal and also can be a living place that is not a building (for example, animals have homes but not houses). 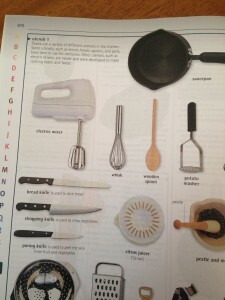 “Utensil” is quickly understood with pictures. Go to a bookstore, pull a couple of dictionaries off the shelves, and ask yourself these four questions. We have more than a dozen dictionaries in our classrooms but the one we turn to most often, the one we usually recommend, is DK Merriam-Webster’s Children’s Dictionary. The definitions are high quality and the colorful, picture-filled pages make it a pleasure to use. For both children and adults, it’s nice to be able to open the pages and see a photo that quickly communicates a familiar idea like utensil. You may decide a different dictionary is better for you. This entry was posted in Book Reviews, Resources, Vocabulary. Bookmark the permalink.